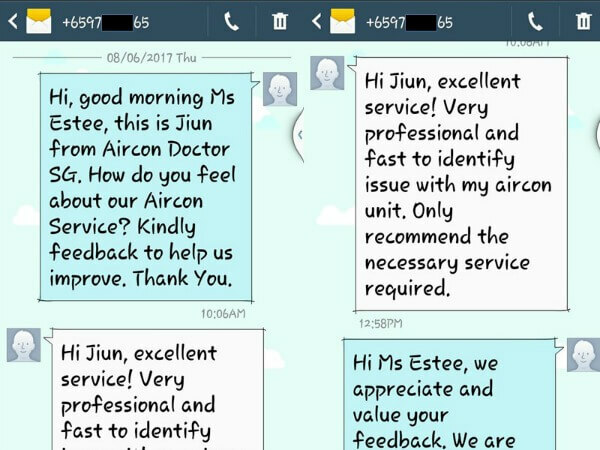 A heartlander in Punggol wanted to find out more about what kind of aircon servicing we provide. She had never tried the chemical wash nor overhaul service on her air conditioners. For Aircon Doctor SG aircon cleaning service, we will remove the aircon filters to clean in the bathroom and then followed by vacuum clean the air-con evaporator coil and fan blower. The difference between that and the chemical wash is that additional chemical cleaner will be applied on top of the normal aircon cleaning. We do not dismantle the whole air conditioner unit for chemical washing unless the customer asked for aircon chemical overhaul service. There are a few benefits for chemical overhaul as the air conditioner will be cleaned up to 90 percent by applying chemical cleaner on the disassembled air con parts. Those air con parts will be then flushed clean in the bathroom. We can only wipe cleaned the remaining 10 percent, which are the electrical parts. Once done, your air conditioner will blow cooler air and the air will smell fresher. Cleaned air conditioner will help you save electricity due to less drag in the suction and blowing, thus save money on electricity bills. It also prolongs the air conditioner’s lifespan, hence reduces repair from frequent breakdown and eventually extends the time for aircon replacement if beyond repair. When her air conditioner does not produce the cooling after the customer set it at 20 degree Celsius, she knew she got to make the call. We did not offered the aircon chemical overhaul, we did an inspection and finished with a normal aircon cleaning instead. Our aircon service company do not push sales nor offer service with the highest price. We will normally sort out after an air con inspection and offer the best affordable solution. We will continue to strive for providing quality aircon service to all our customers.